New Delhi, Sep 21 (IANS) The AAP on Thursday accused Delhi Lieutenant Governor Anil Baijal of trying to “scuttle” the assembly’s House Committees, which the party said were holding government officers responsible for work carried out by their departments. 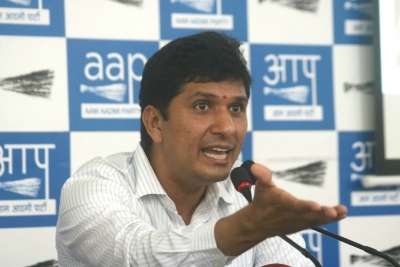 Addressing the media here, Aam Aadmi Party (AAP) MLA Saurabh Bharadwaj said these committees looked into various issues like health, roads, canals, unauthorised colonies and held government officials accountable. Bharadwaj said the Lieutenant Governor’s office wrote a letter to the Home Secretary that these committees were “unconstitutional” and should be dissolved, which has since been leaked to the media by an official posted at Baijal’s office. The AAP leader said that these committees were present in other states as well and were not unconstitutional. The House Committees were also accused of summoning and pressurising officials. “Are these officers being pressurised by MLAs (members of committees) for personal favours?” he asked and added that the officers were confronted for slow pace of work by departments and irregularities therein. Bharadwaj demanded that the Lt Governor explain why his office was against holding officials accountable. On September 9, a Bharatiya Janata Party delegation had met President Ram Nath Kovind and sought his intervention in the functioning of the AAP government in Delhi, which it dubbed “unconstitutional and undemocratic”, referring to the house committees. The delegation said the committees were taking over the executive, judicial and investigative functioning of the Delhi government and they were constituted illegally.